I love cycling and would love to cycle every day, but its just too much for my little legs to cycle 25km in and 25 km home. So, a couple of times I tried the – train halfway cycle the other half. In Sydney! Man, did I get some stares, tuts and general abuse about bringing a bike on the train. Especially in peak hour when it had poured with rain – not to mention the fact that it was summer and I got so blimin cold from being wet in an air conditioned train. The answer can be found in overseas as usual, the one above is in France. Take a typical train carriage, remove the seats, but in some none slip flooring that doesn’t matter if it gets wet. Provide a hanging or rack system for the bikes and voila, a train that cyclists can use without pedestrians getting the shits with us. Awesome. Yep, pedestrians can still use it – no you don’t have a seat but who cares, stand for a bit it’s not often you get a seat anyway. Don’t you need to provide seats for the cyclists, nope. We’re either wet with rain, dripping with sweat or filthy from the roads so the floor is all good if I need a rest. The one below in the US has seats and bike racks. Yes, you can do it with Sydney double decker trains, just convert one of the decks to bikes or even both. It’s ok to carry a bike up or down a few steps. 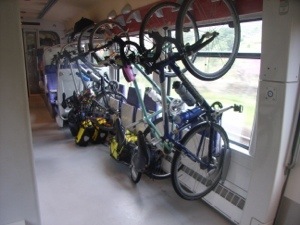 We now have carriages at the end of the trains that are ‘quiet’ carriages so why not ones for cyclists. Well apart from the obvious health benefits. It can also increase the commute distance from train station to start or end of destination. If it is a bit too far to walk at the other end, cycling is the next option. And if you can take your bike on the train without abuse and without it needing to be a foldup bike with its own case or bag (stupid rule that one) – awesome. People are more frugal, we need to turn around our obesity pandemic and its better for the environment if we get people off the roads. 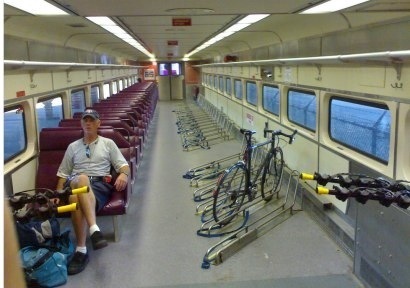 Come on all those Australian train operators, lets bring in cycling carriages on our commuter trains. Great blog, I’m also a strong advocate of cycling as a means of transport, keeping fit, and improving the environmental and social quality, and arguably the productivity, of our cities. I agree with you on the potential benefits of improving facilities for taking bikes on trains, and the French have it sorted. After running the gauntlet cycling through Paris, my wife and I had a similarly positive experience travelling from Paris to Tours by train – hang the bikes up and relax, with no staring or tutting. We also need to improve provisions in the buildings we work in, and the planning of our cities, with regard to cycling infrastructure. There is anecdotal evidence that what the industry thought was ample allowance for cyclists facilities a few years ago, is now insufficient for newly filled corporate tenancies. Great to have Jan Gehl in Melbourne at the moment advocating walking and cycling in cities, and to see Boris Johnson committing 1.5 Billion GBP to a cycling masterplan for the London. Now that is leadership, and I’m sure not by chance when it comes to the subject of getting future votes. All eyes will be on Adelaide next year at Velo-City Global 2014…. Hi James, thanks for the comment. It would be great to see the data about cycle facility useage in office buildings. My cynicism says they aren’t used enough but it sounds like they might be, which is great news.